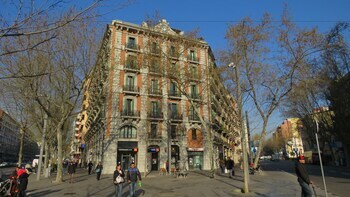 Located in Barcelona (Ciutat Vella), Stay Together Barcelona Apartments is within a 15-minute walk of Palau Guell and Gran Teatre del Liceu. Featured amenities include multilingual staff, luggage storage, and laundry facilities. A roundtrip airport shuttle is provided for a surcharge (available 24 hours), and self parking (subject to charges) is available onsite. With a stay at this apartment in Amposta (L'Eucaliptus), you'll be minutes from Platja dels Eucaliptus. Free self parking is available onsite. With a stay at this apartment in Malaga (Centro), you'll be a 4-minute walk from Malaga Cathedral and 7 minutes by foot from Malaga Amphitheatre. Self parking (subject to charges) is available onsite.